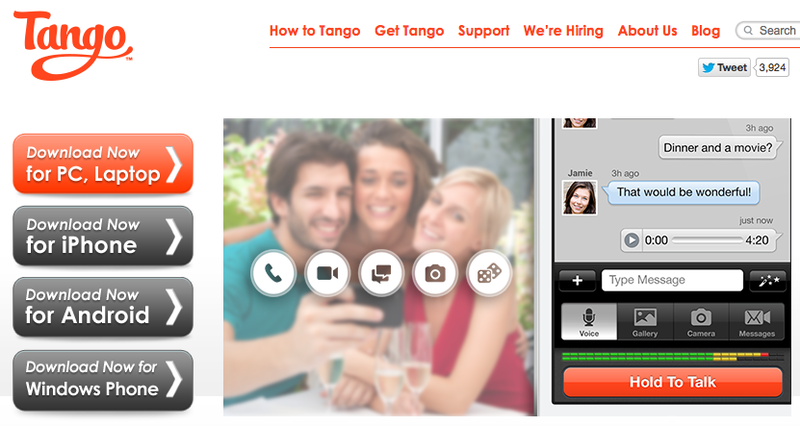 Tango is a free mobile video communications service that allows you to connect with friends and family to conveniently capture and share life’s every day moments. Tango lets you see a smile while you hear the laughter that goes with it; lets you see the twinkle in her eye that accompanies her words. With Tango, you capture life as it happens. Tango works on the PC, iPhone, iPod touch, iPad, Windows Phone 7 and all Android 2.1 or later phones and tablets over 3G, 4G, and Wi-Fi, giving you the ultimate flexibility in how, where and with whom you communicate. 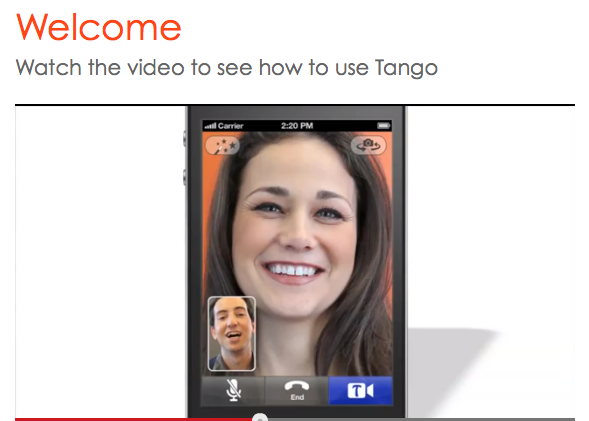 Tango was designed for “mobile” so it’s easy to use and fast to get started. So, why wait to Tango? The ultimate in convenience – Tango works on the PC, iPhone, iPod touch, Windows Phone 7 and hundreds of and Android phones and tablets, and 3G, 4G and Wi-Fi. Just go ahead and Tango. We find the people on Tango that you know — Using your contact list, Tango automatically finds the people you can Tango with — and you can invite anyone else by text or email. On Android phones you can even Tango directly from your address book. Easy to use, easy to get started – There’s no log in or password, and creating an account takes just seconds. Tango works the same on every device so you don’t need to learn anything new. And it was built for “mobile”, making the experience simple and intuitive. Save money – Make free video calls and free phone calls to friends and family in the same town or around the world. Ideal for mobile – Conserves your battery, saves your mobile data plan, and is optimized for mobile networks such as 3G and 4G to give you the best calling experience — everywhere. It’s just like being there – Tango’s high quality video makes the experience as real as if it were face-to-face. Communicate in a way that fits the occasion – Easily switch from video to voice and back with just a tap. 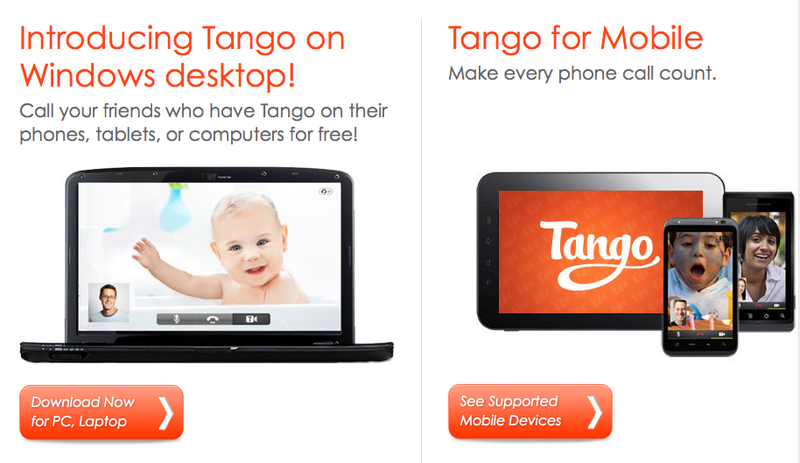 Use Tango on your phone, iPod touch, or tablet — your choice. Standards: Interaction. Tools: Video Chat. Disciplines: All. Grades: 3-5, 6-8, High School, Higher Ed., Pre K-2. Verbs: Apply, Demonstrate, Exhibit, Illustrate, Interview, Practice, Present, Teach.